My sister and I grew up in an extended, old European family where togetherness was a central component of existence. We spent most summers with our grandparents in a small village in Serbia, and daily interactions revolved around a large dining table set on a breezy veranda. Grandparents, aunts, uncles, cousins, friends, neighbors – people of different generations – anyone from the village – spent time there together. We ate meals together, had coffee and cake, played cards, listened to stories and argued about politics. Many evenings my grandmother’s friends arrived and tried out new knitting or lace-making patterns. My grandfather’s war buddies came to share stories of old adventures and drink a glass (or two) of plum brandy. The mailman stopped by every day to deliver mail, have a cup of coffee and a glass of brandy, and tell us the news of the village. I spent hours reading Tolstoy while Branka played with dolls under the table and grandfather stopped me to repeat what battle strategies Napoleon employed. If a Serbian dance (kolo) played on the radio, whoever was at the table would get up, join hands and dance with the music. My sister Branka wanted to recreate that kind of life for our own families, here in the U.S., and she started with the table. She ordered a dinning set from a fine Amish craftsman; it appealed to her that a cabinetmaker would care so much about his handiwork, that he would make something lasting and beautiful. The table and chairs that arrived were one of a kind. The wood was honey colored oak, inlaid with a cherry design. There were four leaves, so a large group of people could sit around it comfortably. The chairs were massive, comfortable and stately. It was the kind of set one leaves for future generations. My sister couldn’t recreate the summers spent on that old veranda in Serbia with her Amish table. But many of the same activities take place here and now. We eat many of the same meals that our family cherished. We drink coffee and eat cake. Our children tell us their plans for the future and we spend hours arguing about politics and about Tolstoy. Our friends get together and we knit and quilt and compare stories. 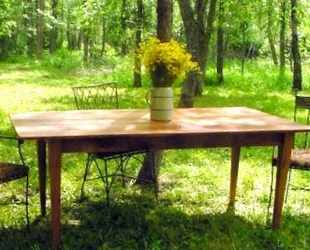 The magic of the old table is still there. That Amish wood-worker knew what he was doing. If every family inthe world were like this, setting around the table talking, laughing and being a family & friends there would be no war, no poverty,& no need for huge governments. This is the ideal world.